For students to effectively progress from arithmetic to algebraic thinking, they must understand equivalence. Unfortunately, there are many students who do not understand the meaning of the equal sign and thereby experience problems interpreting, modifying, and answering equations, specifically those that incorporate multiple numerical terms. Equivalence activities can also be used to develop student's relational thinking. Students will use their problem-solving skills to investigate equations involving addition, subtraction, and multiplication. 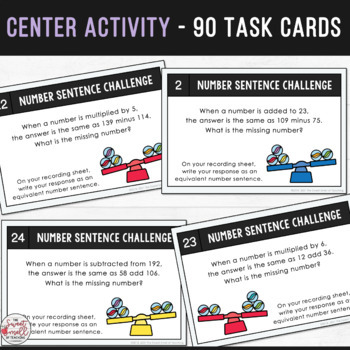 When students receive a set, they will move through each card, and work out the missing number. After this, students will use this information to write the entire equation out as an equivalent number sentence. Activities become progressively harder as students proceed through each level. 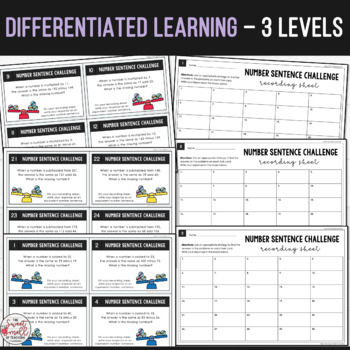 Advanced students will move through to the level 3 task cards. 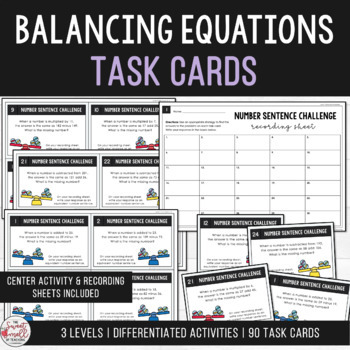 Those experiencing difficulties may remain on the level 1 task cards to practice the basic concepts involved with equivalent number sentences. Equivalent number sentences involving addition and subtraction. Equivalent number sentences involving addition, subtraction and multiplication.